There’s so much to tell about Taiwan that we do not know where to start. This country has the biggest economy outside of the UN, and the most populous country among non-UN countries, too. The business community of this country is built on shipping, manufacturing, and banking (including such companies as Hon Hai Precision and Fubon Financial) and has a great impact on Asian and world economy. It is one of the strongest and fastest growing commercial hubs in the world. Which is why business class airfares to Taiwan are so popular nowadays. You may find numerous meeting and exhibition facilities (mainly located in the capital city of Taipei) for holding successful business events. Taiwanese service proficiency and attention to details will make your gatherings and workflow extremely effective. This country is also a great tourist attraction, which is why people often look for cheap business class tickets to Taiwan. You will for sure be amazed by the National Palace museum in Taipei and Fo Guang Shan Buddha Memorial Center in Kaohsiung. You may also find various shopping centers, national cuisine restaurants, karaoke, traditional markets etc. Taiwanese culture is truly worth exploring. Taiwan is a rather big island. It is served by four major airports in big cities (Taiwan Taoyuan International Airport, Taipei International Airport, Kaohsiung International Airport, Taichung Airport) and over ten domestic airports. Looking for business class fares to Taiwan, you are more likely to find flights that land at Taiwan Taoyuan International Airport. You might say that flying in coach class cabins is much cheaper. It’s true; however, you will not get a wide range of benefits, which are provided by business class cabins. If you hate waiting in long lines to check in, business class is just for you – it often has separate check-in counters. No more waiting! You may also get an access to special business lounges with various facilities, including free Wi-Fi zones and hygiene rooms. When you get on board, you experience premium services. However, the biggest advantage is business class seats. A long-haul flight is always a stress for your body so you need extra comfortable seating to relax. Wide, fully flattening seats provide you with comfort throughout the flight. You have both a certain amount of solitude and an access to aisles. With such a seat, you, without doubts, will avoid jet lags. Useful amenity kits, plush duvets, and pillows, extra services – all of these features will make your luxury flight to Taiwan comfy. Entertainment systems with fresh movies and series will not let get bored during the flight. Every gourmet has a chance to enjoy meal services (no pre-packed dishes, only fresh and natural ingredients!). 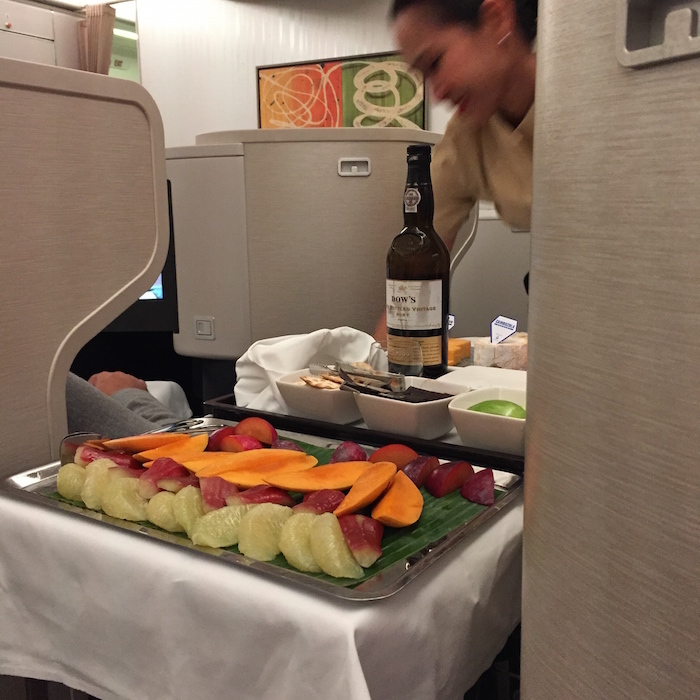 Airlines participate an infinite competition of onboard meal services. Some of them allow booking special meals in advance. Such luxury is only available in business class cabins. Along with the aforementioned list of premium services, you also get the most experienced and skilled flight attendants of all. You ought to seek cheap business class tickets to Taiwan because, for sure, traveling must be comfortable. We have chosen three carriers that provide best business class deals to Taiwan. Each of them holds a unique set of features. Let’s explore them in details. 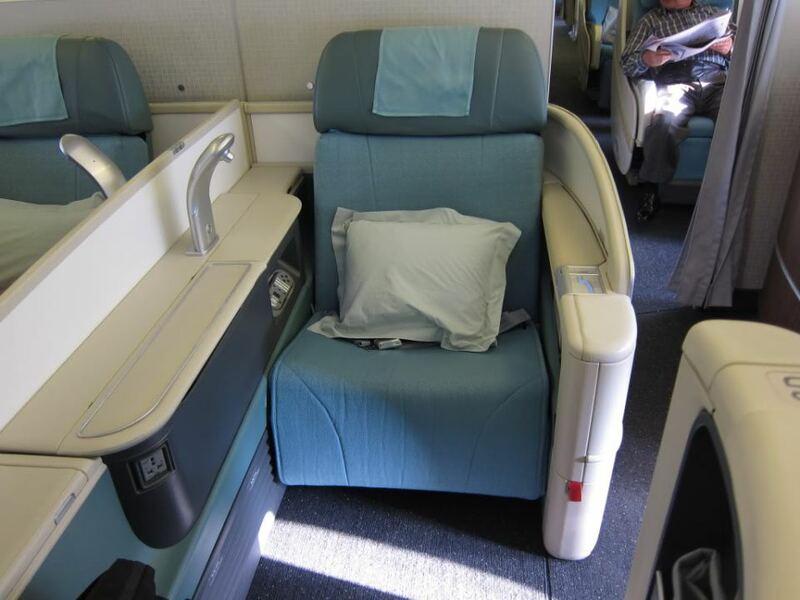 Korean Air business class cabins look quite tranquil with its signature teal fabric. The seats are arranged in 2 x 2 x 2 configuration, which gives a total access to the aisle for every passenger. In terms of dimensions, each seat has 78 inches in pitch and is 21.6 inches wide. You will find 2 USB port, the three posture settings (upright, reclined and flatbed) and additional seating controls. Entertainments system consists of 15.4-inch seatback-mounted screens, which can be controlled by a touchscreen or a detachable remote. It is filled with both Western and Asian content – movies, series, games, TV shows etc. Every passenger gets a gray amenity kit with a comb, a toothbrush and toothpaste, DAVI skincare cosmetic and an eye mask. Typical for Asian carriers, Korean Air offers two options for each meal course – Western- and Asian-style dishes. You should definitely try traditional bibimbap with minced beef, seasonal vegetables, and Gochujang hot pepper paste. 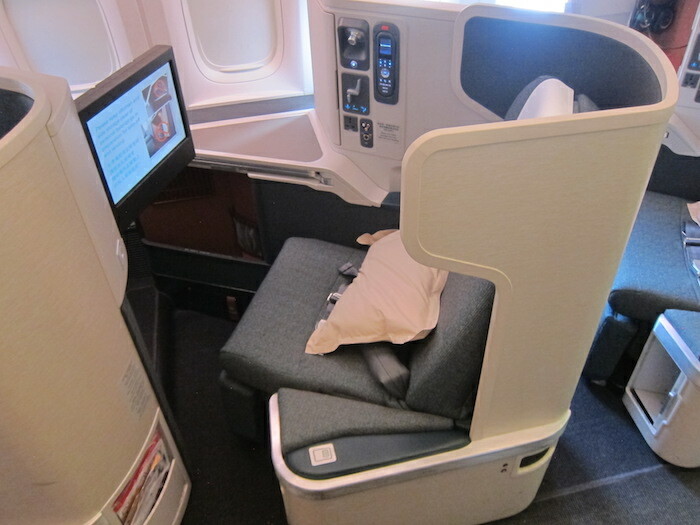 Cathay Pacific business class cabin has 1 x 2 x 1 seating arrangement. Seats have a new curved design that gives you a feeling like there’s no one else around you. Of course, seats can become fully flat beds for a short nap or an overnight sleep. Seating in the center, you can open your cupboard door to “screen” off the passenger next to you. You also get a huge overhead hand luggage storage and several lockers (a foot locker, a spacious side storage area, and a side cupboard). Entertainment supplies include TV screen with touchscreen controls and noise-cancelling headphones. You also get a power supply with an international adaptor and a mirror. Meal services look more like a ritual with, white linen tablecloths, hot scented hand towels, and various cocktails. Don’t forget to try Szechuanese chicken with Yu Shang chili sauce and steamed rice – absolutely delicious. America’s largest carrier, United Airlines, also provides cheap business class flights to Taiwan. Business class seating seats are set in 2 x 2 x 2 arrangement. 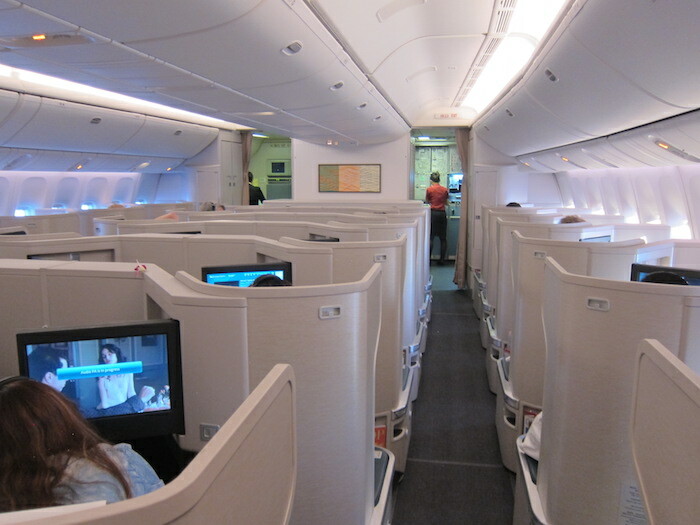 There’s 78 inches of seat pitch in business class, with seats converting to a 78-inch fully flat bed. The seat is 22 inches wide. Along with standard overhead lighting, you get additional reading lighting, which allows entertaining yourself without bothering other passengers with lights. Of course, you have a power socket and a USB port. More than 150 hours of movies, series, and TV shows are available via entertainment systems with 15.4-inch touchscreens. You may also get Wi-Fi access by request ($16.99 for the entire flight). The amenities kit consists 0f an eye mask, toothbrush and toothpaste, socks, tissues, lip balm, and hand cream. For meal services, United Airlines have a significant offer of a cheese selection or its famous sundaes. We have something more to help you choose the airlines. Below you can fins real reviews, with all the pros and cons. If you enjoy having unique business opportunities and exploring ancient cultures, get your business class tickets to Taiwan as soon as possible! You will not regret it – guarantee 100%!